Whether your festive tradition is to go out for winter walks on Christmas Eve, Christmas Day or Boxing Day, most families in Merseyside venture out to burn off some of those mince pies at some point. One of the best things about living in Liverpool is that we’re spoilt for choice when it comes to parks, green spaces, forests and beaches. Nothing can be more invigorating or relaxing than a nice walk in the Mersey air. 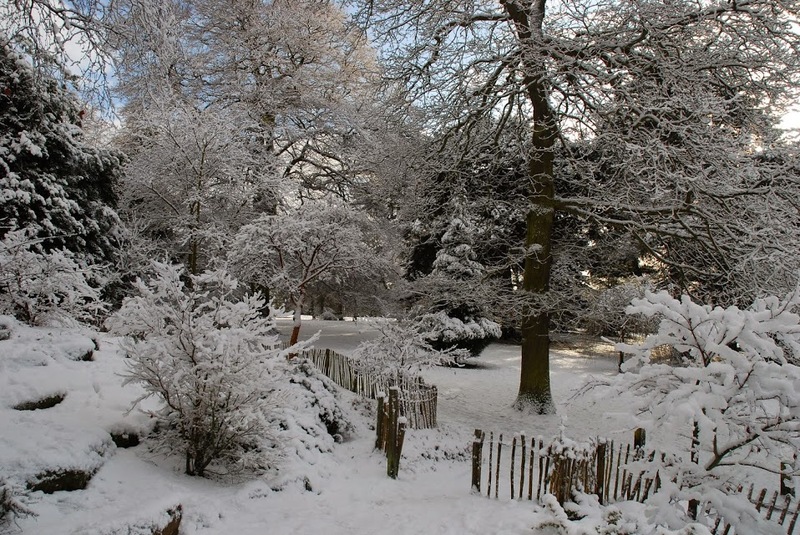 So, to celebrate our favourite chilly time of the year, we’ve found some of the most magical winter walks in Liverpool, just in time for Christmas. Beginning with our favourite, Sefton Park is a beloved space in Liverpool and the perfect destination for a Christmas walk with your loved ones. There are lots of beautiful walking routes you can take around Sefton. Choose to make your own trail up through the 235 acres, or follow the perimeter and get the best views of the frosty lake on the Aigburth side of the park and the stunning Palm House. The winding pathways and 2 mile perimeter trail are perfect for working up a sweat or taking a leisurely stroll. You can access the park via Queens Drive, Greenbank Drive, Aigburth Drive, Lark Lane and Elmswood Road. After your walk you can even enjoy a coffee and a slice of cake in one of the cafes on Lark Lane. Next in our list of favourite winter walks is an easy, but stunning route from Liverpool’s Pierhead to Otterspool. This walk is about 4½ miles in length and begins at the stunning Three Graces, which are even more breathtaking with a dusting of snow. Continue through the Albert Dock and follow the Mersey Way along the side of the river until you reach the delightful Otterspool Park. Most of the walk has great views of the Wirral and North Wales, plus the bracing sea air will help you work off those pigs in blankets. The route is not circular but there are frequent buses along Aigburth Road back to the city centre and there is a great café for refreshments at Otterspool before your return journey. 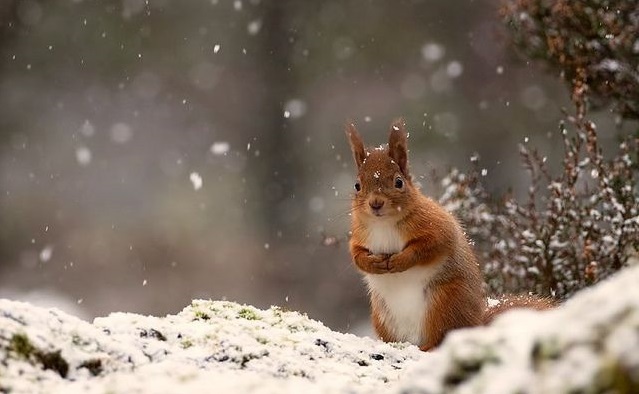 One of the most satisfying winter walks is the Red Squirrel trail around the beautiful woodlands surrounding Formby. 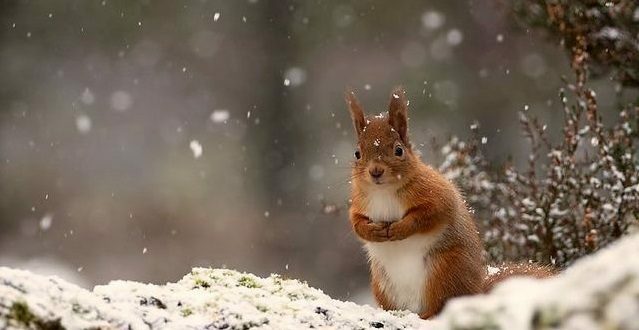 ​You can follow this well signposted walk and look out for the growing population of red squirrels foraging in the snow! This walk usually takes around an hour, but if you’d prefer to extend it, there are plenty of routes that will take you further afield. Follow the asparagus trail and wander through crop fields to discover how a spring vegetable helped shaped Formby as it is today, or wind through broadleaf and pine woodlands before reaching the impressive sand dunes of Formby beach. Climb up the dunes for superb views over Liverpool Bay, Snowdonia and the Lake District. This wonderful walk also features on our guide to the best scenic walks and trail near Liverpool, it’s not all about winter! If you’re looking for a gentle winter stroll, head to Woolton Woods & Camp Hill and discover the pathways of this beautiful and historic park. Start at the High Street near Woolton Village and follow the sloping paths. The park boasts a lovely walled garden, delightful woodlands and magnificent views from Camp Hill, formerly a bronze age encampment. 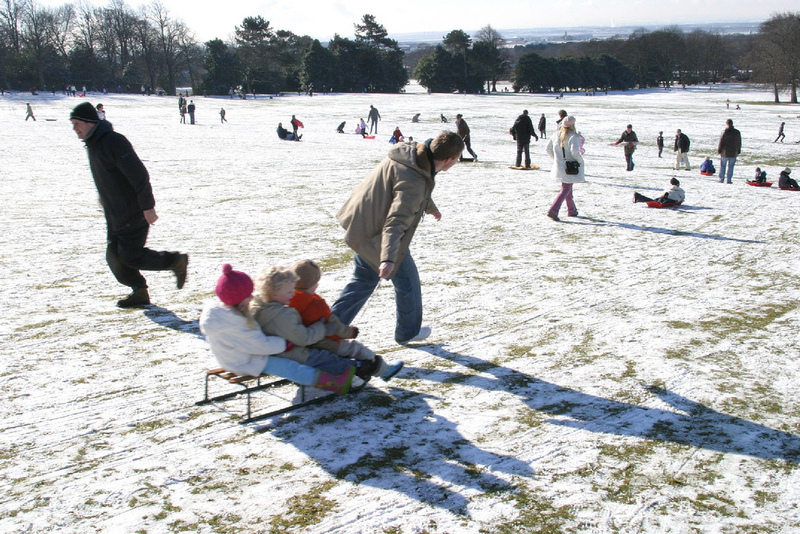 The beautiful Camp Hill is also one of the best places to go sledging in Liverpool! 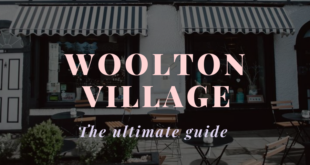 Finish the walk with a well-deserved bite to eat or drink at the many coffee bars and cafes in Woolton Village. 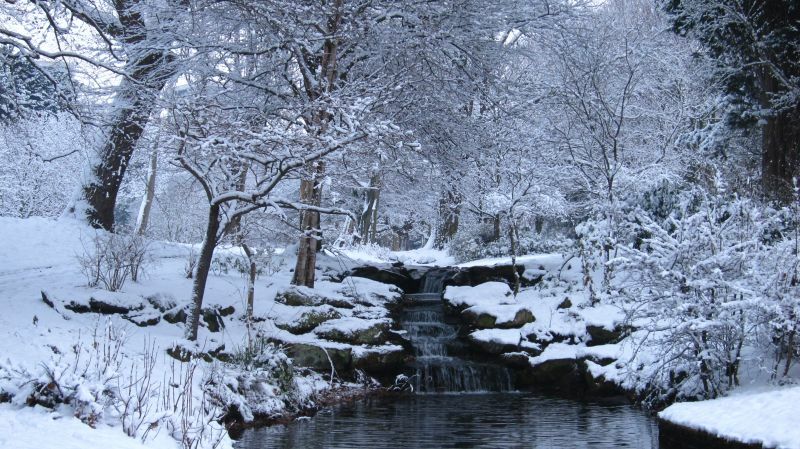 This stunning park covers nearly 100 acres and offers a huge range of winter trails and pathways, taking you through beautiful woodlands, lakes and a lovely botanical garden. The park is named after a number of ancient megaliths that are said to be older than Stonehenge. Explore the picturesque stream and cross the bridge, look out for the 1000 year old tree and the secretive, peaceful Japanese garden. The Trans Pennine Trail runs past the northern edge of the park, you can pick this up to continue your walking in the area. Heading west will soon bring you to the expansive Sefton Park, here you can also join the circular Liverpool City Walk which takes you to some of the main sights of the city. This walk from Waterloo to Hightown, following the Sefton Coastal Path, is about 4½ miles (7½ km) in length and takes you along the beachfront at Crosby. 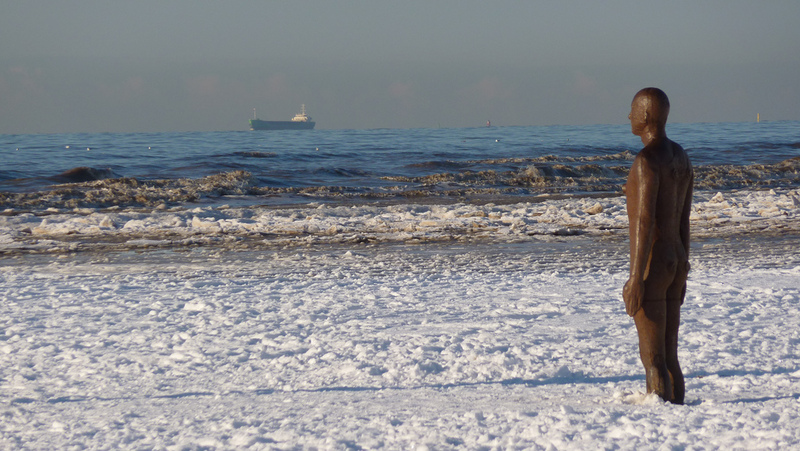 Famous for artist Antony Gormley’s sculpture Another Place, Crosby beach is even more beautiful at winter. Starting at Marine Cresent in Waterloo, with its beautiful waterfront houses, you will pass the Crosby Marine Lake and Promenade, and end up at the village of Hightown. Look out for the remains of a 4,000-year-old submerged forest and grassland teaming with wildlife. Architecture along the route reflects Liverpool’s seafaring past, including the Victorian homes of prosperous captains. At high tide, the shipping lane to and from Liverpool’s docks will be busy with tankers, freighters and ferries. The route is not circular, but is conveniently located for using the frequent trains between Hightown and Waterloo. The way is on hard surfaces, good tracks and over sand dunes, the perfect terrain for winter walks. 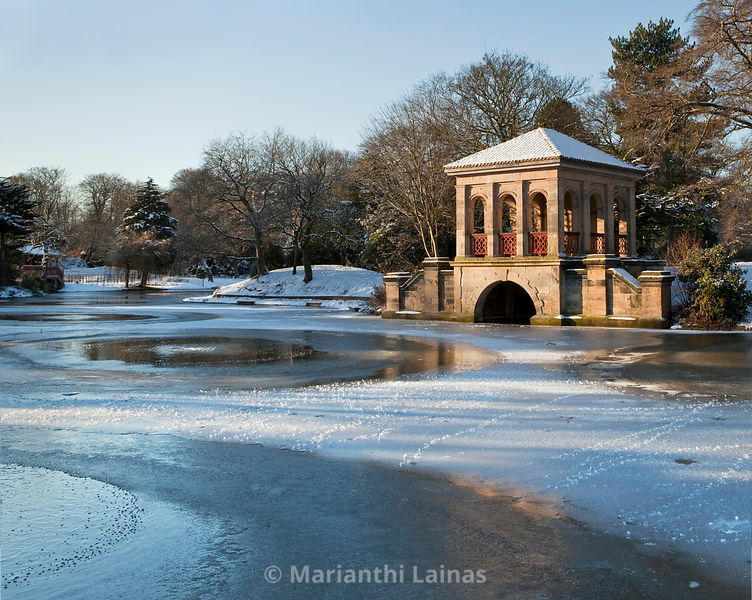 Birkenhead park was the inspiration behind the world famous Central Park in New York and it’s one of the best places to explore during a winter walk around Liverpool. You can follow the fitness trail around this beautiful area and discover the wonderful lakes for fishing, the ornate Swiss bridge, impressive main gate and see if you can spot the famous Roman boathouse which might be guarding the frozen lake! There is also a playground which is ideal for the children, a visitor’s centre and a cafe to get cosy in. A little bit further afield, West Kirby offers walkers a glorious seafront route with breathtaking views to Hilbre Island and the North Wales mountains. For this walk, you start at West Kirby train station and then turn right along Grange Road. On the right, opposite Orrysdale Road, is the entrance to the Wirral Way. You can explore Ashton Park and venture over the bridge towards Caldy Hill and the Mariners Column. Heading up over the brow of the hill, you can feast your eyes on some truly wonderful views. Make your way back to the train station via Kings Drive and Caldy Road, featuring some spectacular winter views of the Dee Estuary and West Kirby Marine Lake, the perfect route for a Christmas walk. West Kirby also offers tonnes of coffee shops and restaurants for a warming hot chocolate or bite to eat to get warmed through afterwards. 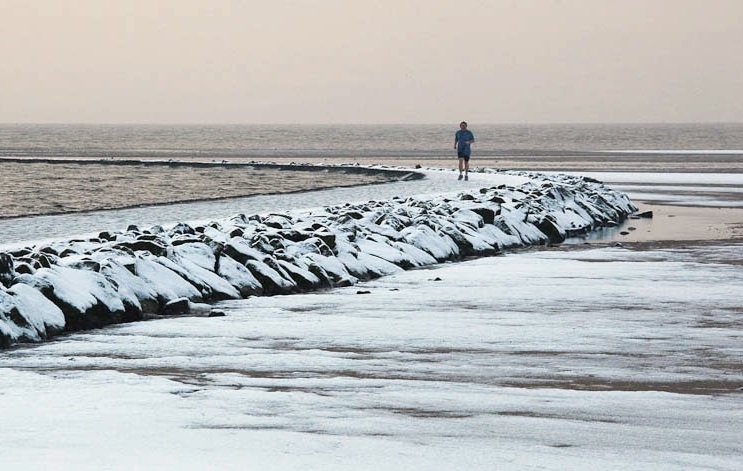 This beautiful seaside resort isn’t just there to be enjoyed in the summer, New Brighton offers festive explorers some of the most picturesque winter walks in Merseyside. 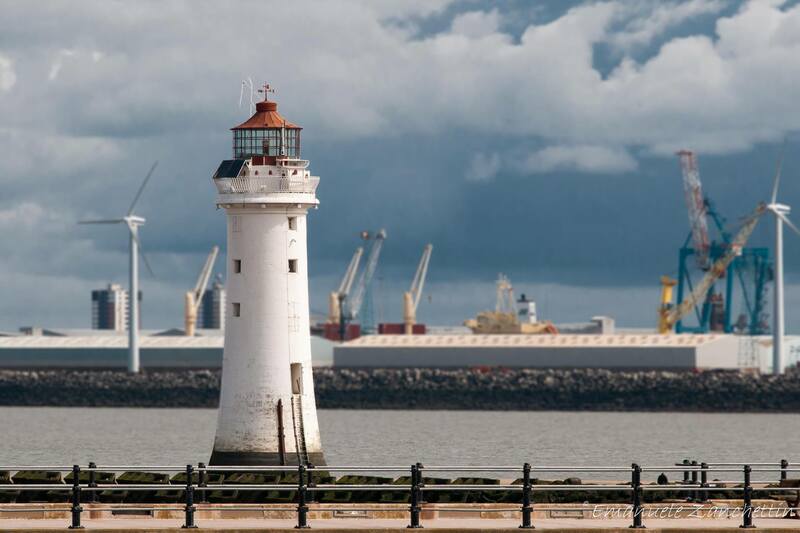 If you set off on your adventure and the weather isn’t too windy, why not walk along Marine Promenade and King’s Parade, around Fort Perch Rock? Take in the bracing sea air and enjoy the wonderful views of the beach. This area also offers some great pubs and bars, stop off for a tasty tipple in The Seahorse or Perch Rock and really make the most of your festive walk. 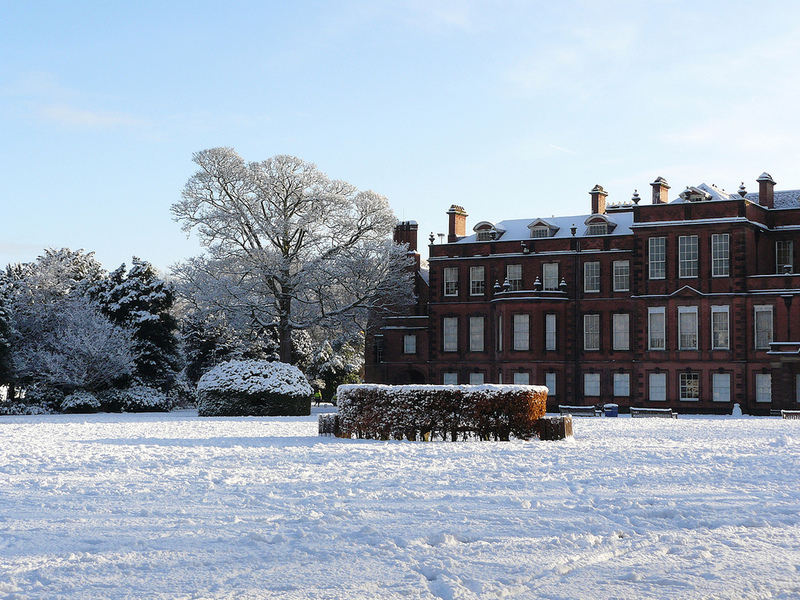 Last in our list of the best winter walks around the city is another gem out in the suburbs of Liverpool, Croxteth Country Park. The perfect destination for a Christmas walk with your family, this beautiful 500 acre park is a favourite with locals and tourists. You can easily spend an hour or two wandering its many pathways and trails, which are even more wonderful when they are topped with a layer of snow. Explore the stables, home farm, play parks, the café along the tracks and bridal paths that are clearly marked, it’s one of our favourite winter walks around Liverpool. 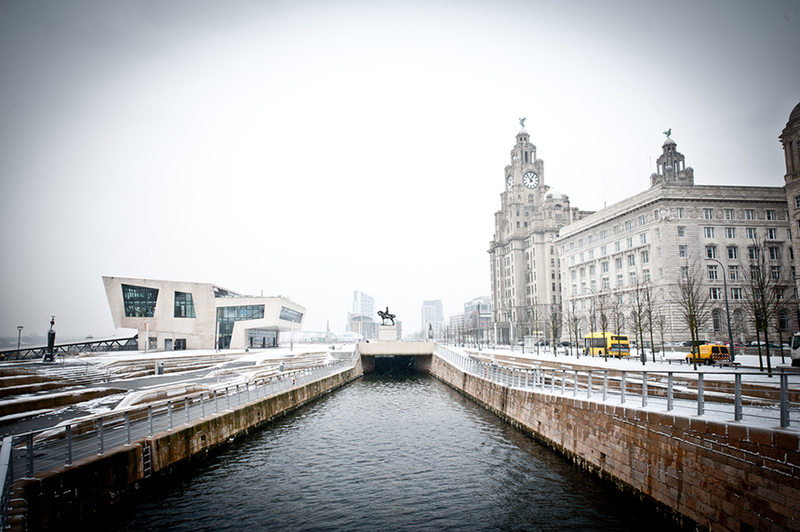 We hope you’ve enjoyed our list of the best winter walks around Liverpool. If you’re looking for the best restaurants and bars to grab a festive bite to eat whilst you’re out, check out our guide to the best family run restaurants in Liverpool. Or, perhaps you’d just like a cosy cup of coffee, we’ve got you covered with our list of the very best coffee shops and cafes around Liverpool.